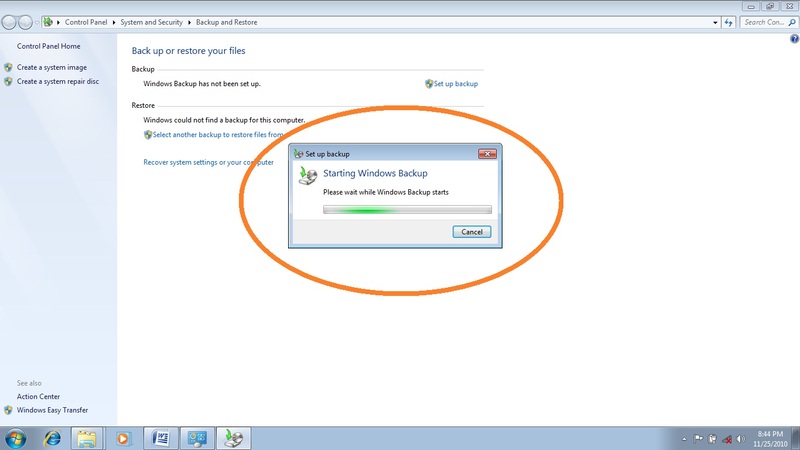 Greetings, to continue on this back-up thing; let’s review what we have talked about, first there’s your checklist of item on what do need before you start the actual back-up, second the option whether what to use in the actual back-up which is whether to use a third party software or use the windows native back-up system. Again i must state that this information is applicable only to Windows user up to the Vista version. 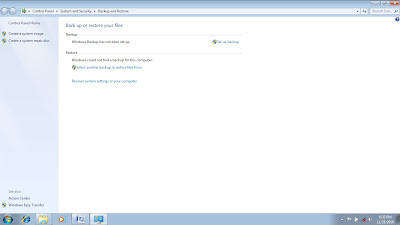 What only up to Vista, what happen if i have a windows 7 version on my laptop or desktop. 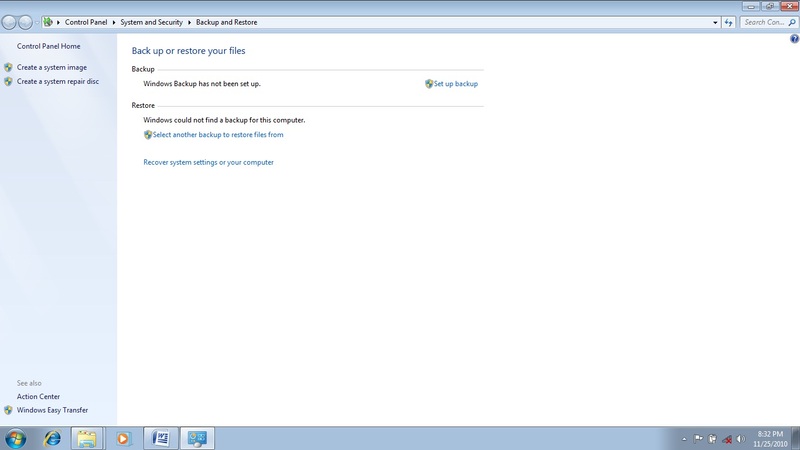 Well in windows 7 there is a slight difference compared with the old windows back-up user interface. Take a look at the image below. They the same user interface right. Now after clicking on the back-up now button, this is where the new user interface suddenly shows itself. Remember only the user interface that is different from the rest of the other previous windows system the function is still the same. Now if you press the Back-up Now button you will the picture below. Yes folks the clever guy back at the windows HQ has change the old user interface if your familiar with the old one. The picture below present a more challenging option than the old ones atleast for most people. Now where do we go from here? 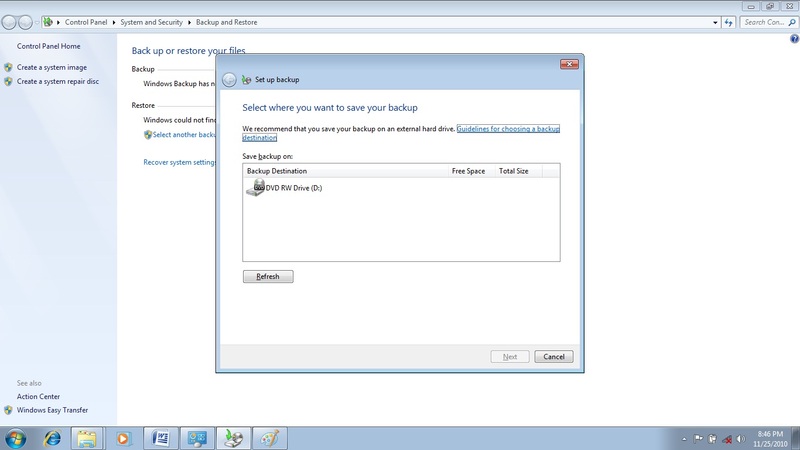 Which option should i choose in order to start the back-up process. 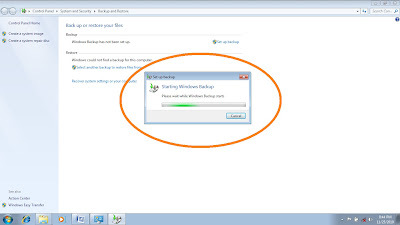 Dont panic its right therein front of you, see the text that said SETUP BACKUP, click that and the next screen will appear to guide on what to do next. Now the picture above appeared after you click the setup backup this interface will for a few second and after that the next picture will appear. Tada, what does this mean? Well this will bring us back to the requirements we talked about. Notice that on the picture there several items worth investigating. 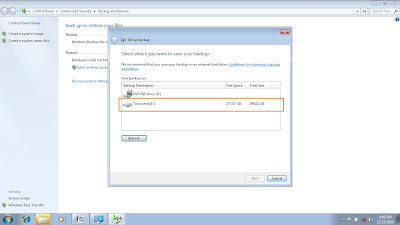 First there is a question asking SELECT WHERE YOU WANT TO SAVE YOUR BACK-UP then the second lines said WE RECOMMEND THAT YOU SAVE YOUR BACK-UP ON AN EXTERNAL DRIVE. What does this first two instructions and question means. Let go back remember i mentioned that we have several choices of what back-up device we need to use. One of those device is the External drive. But i don't see any external drive on the picture. This is because the external drive it is not yet connected to the laptop or desktop. I will connect my external drive to my computer show you what will be added to the picture below if your preferred device for back-up is connected before you start the back-up process. 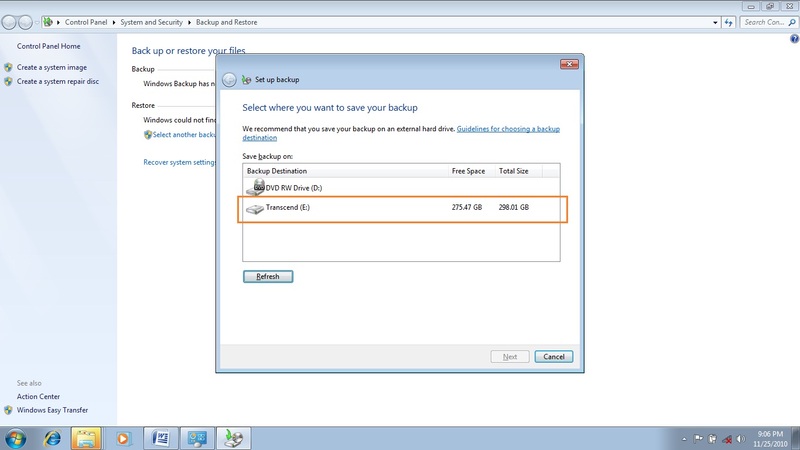 Now as you can see on the picture above, it is highlighted a red box a next item is added to the choices where only the DVD RW drive is present now after connecting the external drive and pressing the REFRESH button the other options now appeared on the interface. Also it is good to know that the people at Microsoft out a guidelines for choosing the backup destination feature. If you want to explore it just click the link below to see the guidelines. Now i mentioned before that it is important for you to connect the backup device or media your going to use because the back tool will look for it. And the tool will not allow you to use your hard drive as a backup destination. You need a separate device for your backup.